The EMT program is a 140-hour course designed to introduce the participant basic life support and pre-hospital emergency medical care. 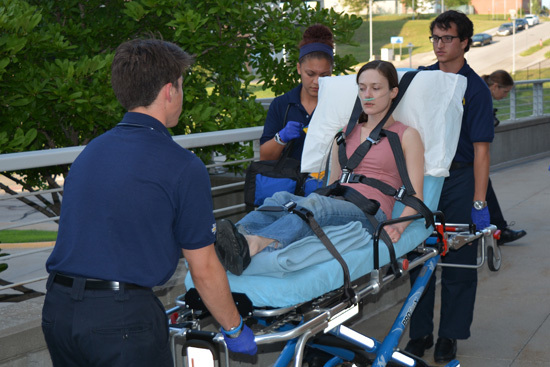 This program is considered to be entry-level for a career in emergency care, and is based upon the 2009 EMS Education Standards for Emergency Medical Technician. There is a clinical and field experience component to provide the student with exposure to the hospital emergency department and ambulance settings. Upon successful completion of the EMT program, a certificate will be awarded that permits the student to participate in the national certification examination to become licensed in the State of Missouri as an Emergency Medical Technician. The EMT program is offered once in the fall starting in mid-August, and once in the winter starting in January. The program meets two nights per week and lasts approximately four months. There is a summer EMT Academy that meets two 8-hour days per week starting in June and lasting nine weeks. Registration for the EMT programs opens 90 days from the first class session and is open until two weeks before the program start date; however, all seats are on a first-come, first-served basis.